Ghanaian midfield maestro Thomas Teye Partey has been presented with the commemorative award he deservedly picked up as member of the first ever FIFPro Africa Best XI team. 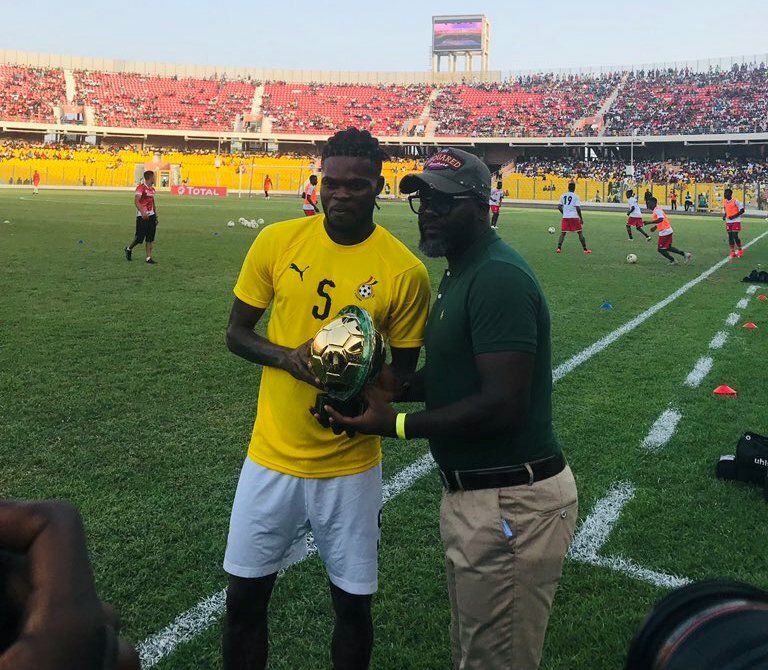 Newly instated member of the GFA Normalization Committee, Samuel Osei Kuffuor, presented the award to Thomas Partey moments before Ghana’s game against Kenya on Saturday on behalf on the Professional Footballers Association of Ghana (PFAG), which serves as the mother body of all Ghanaian professional footballers. The Atletico Madrid ace enjoyed a stunning year in 2018 for both club and country, and this most recent honour has been widely viewed as another well-deserved accolade. He was recently shortlisted for the BBC African Player of the Year Award in a year highlighted by his exploits in helping ‘Atleti’ scoop the UEFA Europa League title, and aiding the Black Stars to qualify for the 2019 African Cup of Nations in Egypt. The PFAG notes with great contentment the huge strides being made by Thomas Partey, and congratulates him for his latest feat. We continue to encourage him and all our other members to continue to excel for their clubs and to shine even brighter for the Black Stars in our quest for AFCON success later this year!